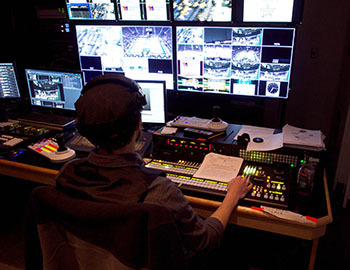 video switcher during a college basketball game at Times Union Center. Cypress, CA, March 4, 2015 – When video production company Myriad Productions was tasked with selecting key components for the upgrade of the Times Union Center’s video production system to HD, they faced a very tight timeframe and couldn’t afford any compromises in video switcher selection as a critical piece of the municipal indoor arena’s HD upgrade. Myriad Productions found the perfect fit in FOR-A’s HVS-390HS 2 M/E video switcher.